It seems like everyone dreads snow chains, even on the way to go skiing. You can conquer this fear by reading our tips, watching the videos and practicing installing chains at home. Learn to love your chains-they give you freedom to travel to the winter hills. We recommend purchasing chains before your trip and keeping them in your car. During chain control periods, as set by law enforcement, ALL VEHICLES, even rentals and 4WD, must have chains in the vehicle. Checkpoints are often manned; if an accident occurs, citations are usually issued. Travel without chains and risk being turned away at a gate or checkpoint, being stuck out on the roads or at your accommodation, or worse yet sliding off the road or into another vehicle.You may wait hours for assistance, possibly pay a fine and buy chains at the highest price. Add in spotty cell coverage and limited towing services and it hurts to be unprepared-- a real vacation downer. Be your family's vacation hero instead, know before you go. When to Carry Chains: We load chains up on October 1st and keep them in cars until at least April 15th. We scratch our heads on why travelers come WITHOUT chains. Chains are cheap insurance to ensure your vacation actually takes place! You will not pat yourself on the back about saving money if you can’t complete your trip. Rental Cars: Do you need chains for rental cars? Short answer: YES! Holly's videos on installing and removing Quick Fit Chains in Yosemite. WHAT are tire chains and cables? -Tire chains and cables are devices fitted to the tires of vehicles to increase traction when driving on snow and ice. Cables are formed from wire cable instead of chain links and are more lightweight, sometimes easier to install and more likely to break. WHY do you need Snow Chains In Yosemite National Park? -Chains can be required by law at any time. Since conditions change quickly and unforecasted weather occurs, including ice, always travel with chains in the car. -Traveling safely can require chains. 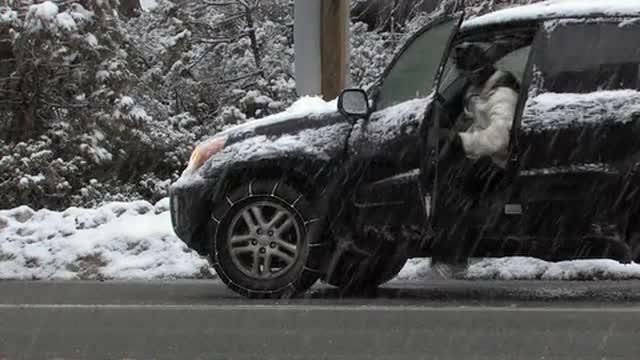 During periods of compact snow and ice on the road, or in the event of a slide-off, even a minor one, you may be unable to get traction without chains. Even 4WD vehicles sometimes need chains to get moving. We have installed chains MANY times just to get out of a short section where without chains we were stuck. -Sometimes main roads are clear due to more plowing and traffic, but neighborhood roads retain ice longer. It’s common to need chains to exit our neighborhood, including traveling up steep hills, in order to reach the main highway, even though our roads get plowed. There are more trees and shady spots in neighborhoods. Slower speeds of travel mean less momentum to get uphill through icy patches. -The intangible “why”: if chains are required by law and you do not have them, your vacation can be severely impacted. Consequences can include not being able to get back to your accommodation, driving hours to go get chains, or at the worst, having an accident or getting stranded on the side of the road. It’s not a personal choice to go without chains when chain control is in place: no one has the right to endanger others by foregoing safety equipment . Rangers strictly enforce the chain requirements. If you pull up to the park gate at 9 pm, thinking you are headed for a late arrival, and chain control is in place, even in your 4WD you will be turned around to buy chains, and all stores might be closed. WHEN do you need Snow Chains in Yosemite National Park? -We load the chains up on October 1st and leave them in the cars until at least April 15th. More commonly we keep them in the car through May 1st. We have experienced some serious snow storms in Yosemite in late April that required chains. -Install chains when required by law (signs or rangers at checkpoints) or when conditions dictate, such as you feel a loss of traction while driving and the road has a covering of snow or ice. We don’t use our chains on black pavement (not covered by snow) unless forced by the chain rating system. Sometimes posted signs require installing chains below the affected area if it is the last place with a safe pullout. On the way down out of the snow, chains may need to be kept on past the snowy area until reaching a safe place to remove. Drive slowly and carefully if using chains on dry pavement as it is very hard on the chains. -Understand the rating systems for chain requirements. Most cars will install chains at “R2”. However, even an R1 rating, which generally means only semi-trucks INSTALL chains, means chains are required onboard by law. What is R0? R0 “R zero” is lingo for “no chain requirements”. -Stage Stop Mini Mart in Mariposa, CA on Highway 140 is the only rental option we know near the park. Click for rates and details . Depending on your route renting may work and is cheaper than buying. We only recommend renting chains for a rental car, since we think the benefits of buying outweigh any cost savings. In addition, we prefer entering via Highway 120 for scenic value and Yosemite experience on that route, with dramatic views of the Valley unmatched on the Highway 140 route. Mariposa is a non-recommended detour from the Highway 41 route taken from LA and places south of Yosemite. - Les Schwab offers the best chains on the market. Their Quick Fit chains are easier to install than cables or any other chains we have ever used. While these chains are not cheap – average price is around $89 – they take the pain out of installing. The quality is high as they are actual chains, not cables. Unlike most chains or cables, you do not roll the car around or “aim” to put them on. They are put on the vehicle when stationary. They are similarly easy to remove. If you purchase these chains for your personal vehicle, you can be assured of many years of use. Purchasing chains in advance allows you to practice putting them on before your trip. 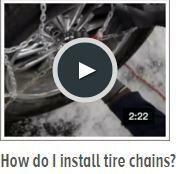 Over the years you become expert at installing your chains, increasing your safety factor on the road. Using these chains is “the better way” and I would rather pay the full purchase price for 1-2 days of use, and take them home as an owner, then struggle with rental chains multiple times during a vacation. Basically, the frustration factor on most chains gets eliminated by the Quick Fit version, so we can’t imagine choosing any other option for a personal vehicle. TIP: You can even find Quick Fit chains on eBay and Amazon . Just be sure to get the exact right size for your tire size – they are custom sized to your tires and the wrong size will not securely attach. If you get close to the park and you missed your chance to buy chains at Les Schwab, you can stop at any auto parts store along the route. We know they charge quite a bit for chains that don’t meet our high expectations now that we are spoiled by Les Schwab Quick Fit chains. They also sell some chains inside Yosemite Valley at the garage, although sizes can be limited. Get More Tips! Read Another Blog Post.